I mean, look how big and flame-breathy it is! Only such extreme fieriness could be possible through the magic of translucent plastic stands. It's not quite as impressive, but hey, take what you get with your giant fire breath plastic. Still looks pretty damn nifty! KAIJU SLAPSTICK IS THE BEST SLAPSTICK. 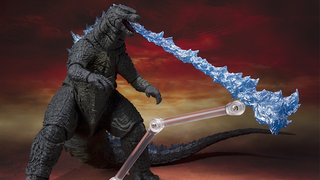 Spit Fire Godzilla will be out in August, for $71. An oddly specific, non-rounded price!